Missouri might ban all federal 2a infringements. Something worth reading for Missouri state residents. This might appear on our fall ballots and is worth voting for from what I’m reading. Re: Missouri might ban all federal 2a infringements. I will move to Missouri if this happens and is actually enforced. Throughout all history, there has been one class of people who have been ordinarily prohibited from bearing arms: slaves. I wouldn’t blame you. I wonder what would happen to my jailed cans? Short - thanks for sending that in. We appreciate it. This actually puts the licensed FFLs into a difficult position if it passes and if it is enforced. The feds could crack down on them, and the distributors/manufacturers, which would destroy their businesses. Beyond that, it could open the door for the Antis to attack the firearms manufacturers, distributors, and retailers should a firearm be sold without the federally mandated checks. Please don't think I support the current status quo, because I don't. I just think that there are a lot of "what ifs?" that may not have been considered within this legislation. If it is passed and if, by the grace of God and the Founders the SCOTUS upholds it, then I think a lot of things will change. However...the flip side could happen. Yeah, I’ve considered that. I figure transfers into the state will be a federally regulated process. Once inside the state, then those dealers who wish to trust the states protection will play the state’s game. I imagine many dealers will defer to the safer side of things and play with federal law vs against it. There would likely be that one instance where a dealer decided to give it a shot and pass an NFA item across the table with little to no paperwork. If the state did as they promised, I could see other dealers following suit. It will definitely upset the entire system the communists have been putting in place in this country for over 100 years to diminish and ultimately eradicate our 2nd amendment rights. That will not go over well with them. The ATF would not be able to do anything to the FFLs in Missouri according to this proposed law. They would no longer need FFLs in order to sell firearms in Missouri. The ATF would have no authority over them. Their businesses would boom. Essentially, Missouri would work the way it is supposed to regarding gun rights. Every other state would still be part of the Post-USA People's Republic of North America with Diversity and Social Justice for All. Something to work out would be how Missouri gun dealers would be able to import guns from other states though. Since they wouldn't have FFLs, out of state dealers and manufacturers wouldn't be able to ship anything in to them unless they retained their FFLs (that would be to protect the out-of-state FFLS--not the ones in Missouri). That would allow the guns into the state per ATF regs, but once they're in the state, they go anywhere and are off the record. Another way it could work is that obviously gun manufacturers could move into Missouri. Anyone who can run a CNC mill can become a firearm manufacturer. Milling AR lowers is easy. So honestly it's a non-issue. There will be plenty of firearms to go around due to all the new in-state manufacturing. You may not be able to get exotic stuff like we here on Bullpup Forum love, at least not for a while. Or you could just convert all your semi-auto Tavors and such to proper full auto once in the state. As far as being afraid of this leading to a worse state of affairs, I'd say that it's time we start boldly taking our rights back rather than fearfully accepting the status quo. Starting next week, people will be looking at spending 10 years in prison because a type of plastic stock has been redefined against the letter of the law as a machine gun. That is unacceptable. It's time we get some sanctuary cities/states for gun rights (ALL gun rights) since the rest of the country is steadily falling to socialism. Don't worry--it may not be your day next week with bump stocks, but it will be one day. It will be your day if you own a semi-automatic and don't want to submit fingerprints and pay a tax to keep "owning" it. It will be your day if you have a binary trigger. It will be your day if you have high-cap mags. It will be your day if you have a pistol brace. It will be your day if you have a sniper rifle. It will be your day if you have a handgun. It will be your day if you have a lever action. It will be your day if you have a shotgun. If will be your day if you have ammunition. It will be your day if you have body armor. It will be your day if you have already registered NFA weapons. It will be your day if you have airsoft guns. It will be your day if you have kitchen knives. It will be your day if you have any allegiance to anything this country once stood for. Just as surely as the day for bump stocks has come, if you own any kind of firearm, with this country on its present course, your day will come too. Yeah Socialist will always want to ban everything...especially things that will challenge their rule and power. 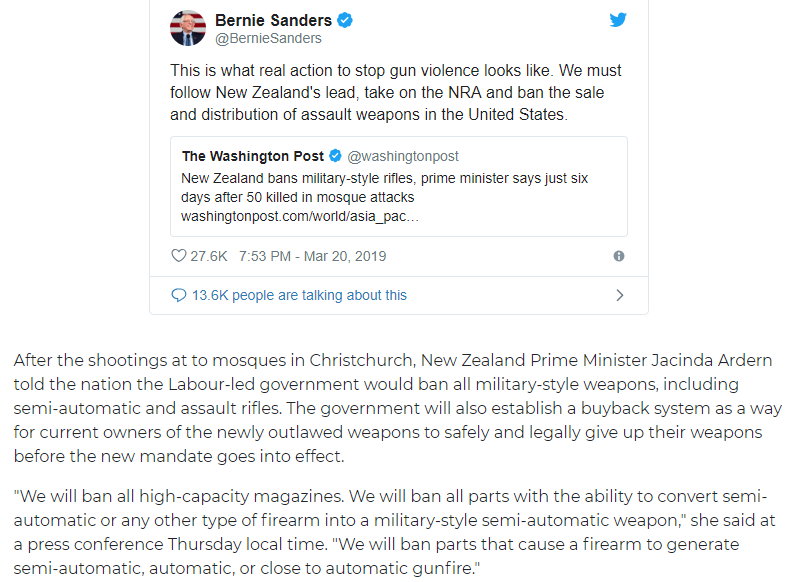 The legal definition of "military style semi automatics" in New Zealand is essentially ALL semi-automatic firearms. We have to fight or the same thing will happen here. Also, be aware of the terms they're using. Notice how they establish these "buyback" programs? The government cannot buy back something it never owned in the first place. Gun "buy backs," in a subtle way, establish the idea in people's minds that gun rights are a privilege, a trust... that the government really has the rights to all weapons and only allows citizens to have them for so long until it decides to take that privilege away. There is no such thing as a gun "buyback" in a free country. It's a right, not a privilege. Doing a small bit of digging, it turns out Missouri isn’t the first state to do this. The Supremacy Clause will and has been used against such laws/states before and likely will happen here even if this passes. Of course that will be used if this passes. It means nothing. Missouri is upholding the 2nd Amendment, whereas the Federal Government is blatantly violating it. Trying to uphold violations of the Constitution with the Supremacy Clause is absurd. The Constitution is the supreme law of the land. When the Federal government violates it, it's up to the States/We the People to stand up and protect the Constitution. The Federal government has to be kept in check or it's only a matter of time before those within it will try to use its power to take down the Constitution--in effect, using the power they have for the exact opposite purpose it was intended. Kansas apparently has already passed this and a couple dealers trusted the state to protect them. Apparently the state did not. I find it truly sad that the Feds don't seem to have a problem with the states legalizing marijuana, something that isn't an enumerated Constitutional right, but they go full Linda Blair with their heads spinning around and vomiting green pea soup when someone does it with firearms. Lots of folks drawing a paycheck payable by the US Treasury need to be educated on the Constitution. It only applies to state officials just like the weed states. Federal law still applies...but a federal agency is the one that prosecutes not state. To be fair, Obama did send the DEA to raid marijuana dispensaries in California for a while, and he was opposed to Colorado legalizing marijuana recreationally. But he relented after social support for the legalization movement grew. I'm not defending Obama, but am pointing out that the same thing happened there that might happen with firearm dealers in states.